The Life Fitness Club Series is one of the best elite indoor training machines on the market today. The quality of its components, the powerful motor and the generous selection of workouts make this treadmill a great choice. If you’re looking for diversity and efficiency, smoothness and high quality the Club Series may be just what you’re looking for. Speed : 0.5 - 12 mph (max 19 km/h), On the second smaller console you have 3 pre-set speed keys: walk, jog or run speed. You set the value for each option. Incline : 0-15%, Same as speed you can preset the value of 3 quick incline buttons: low, mid or high incline. * Numeric keypad, that you use to introduce exercise time, difficulty level, belt speed, weight, distance, goal selection, gender and target heart rate. You also have a clear and enter buttons available. The Club Series has a LED display console with a 16 character Message Center. You can monitor your heart rate via the grip sensors or wirelessly for more accurate readings. To use the grip sensors, grasp the stainless steel sensors on the handlebars. Hold them for 20-30 seconds. We recommend you to use this system for speeds below 4.5mph or 7.2 kph. If you plan to run faster or go through the heart rate workouts use the Polar chest strap which leaves your hands free. We find the heart rate readings on the Club series to be quite accurate, especially compared with some of the lower priced models. The My Workouts feature allows you to pre-set up to 7 workouts according to personal information, but keep in mind that you can set up other workouts also, such as Fat Burn, Cardio, Heart Rate Hill, Heart Rate Interval, Extreme Heart Rate, 5K, 10K, Time Sport Training, Hill, Random and Manual. Alongside the 16 pre-programmed workouts, the Club Series gives you the Fit Test workout that monitors your cardiovascular fitness. Every 4/ 6 weeks you can check out endurance increase. The workout lasts 5 minutes with a 5% incline. The score is displayed in the Message Center. In order to get accurate scores, you should perform the test 3 days in a row. The Club Series has a set of workout features that make training fluent and offer great feedback. The InstaPace feature is a feedback system that keeps track of your pace and rate of minutes per mile. The Cool Down Mode helps your heart return to a normal pace at the end of the workout. On-the-Fly Programming lets you navigate through workouts without losing your current information. The Life Fitness Club treadmill also features FlexDeck shock absorption which minimizes impact on your knees and joints up to 30%, an integrated accessory tray, a powerful yet quiet 4.0 HP motor with Magna Drive and a generous warranty. The Club Series is an excellent workout machine that we highly recommend to anyone looking for a heavy duty treadmill. Either at the gym, the club or in your own home, this high quality treadmill will serve any workout need, either staying fit or getting ready for competitions. The Club series has the same high quality of Life Fitness components that the Platinum series offers. The powerful 4 horsepower motor will engage you in long and effective workouts, and the great thing about it is that it runs smoothly and quietly. For a machine this powerful, being able to enjoy the quietness of a good workout is amazing. 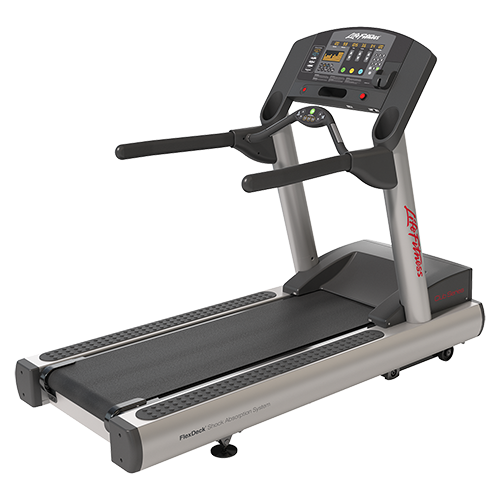 The main reason is that this treadmill borrows features from commercial equipment, designed for daily and intensive use. The heart monitoring system is common to Life Fitness commercial models and equally accurate and effective. It was quite a surprise to see how rigorous the Polar telemetry and Lifepulse system can be. This is a great advantage for HeartSync workouts. All in all, if you can afford it, this is as good as it gets in residential treadmills and the Life Fitness Club is once again at the top of our list in the price category. There are 16 pre-programmed workouts that you can access on this treadmill, effective and challenging, it depends on your goals.